So this is the first solo album with Bernie Marsden I have ever heard and as a Whitesnake fan – a HUGE Whitesnake 1978 – 1984 fan – I sincerely hope that Bernie will deliver the goods. 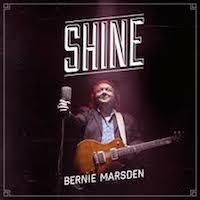 Bernie Marsden is known mostly for his soulful guitar playing and his blues feel, but maybe few knows that Bernie isn’t half bad as a lead vocalist as well. Back in the day he used to sing lead on a couple of tracks with Whitesnake – “Free Flight” and co-lead on “Lie Down” from Whitesnake’s 1978 album Trouble, an album we’ll get into more here in a bit, and “Mean Business” from Lovehunter (1979), so it’s not a shocker that he has decided to sing lead on his new album. Now, I’m not that familiar with old blues songs and such, so the opening number, Ledbelly’s / Taj Mahal’s “Linin’ Track” just makes me think of Aerosmith because they used bits of that song for their “Hangman Jury” track off their Permanent Vacation (1987) album. It’s a great track and I think Bernie really nails it. “Wedding Day” is a catchy pop / blues track, very memorable, “Walk Away” is a pop rocker, very close to AOR and catchy as hell and it’s nice to hear that Bernie’s mind isn’t narrow when it comes to music. His Whitesnake roots comes alive on “Kinda Wish She Would”, a rhythm n blues rocker that would have sounded brilliant with Coverdale’s voice over it. “Ladyfriend” is a slow blues ballad that would have fit perfectly in a smokey barroom, relaxing on an armchair with a single malt in your hand. With Marsden and Coverdale burying their hatchet and patching up again, it was a no-brainer that Cov would show up on this album. They give us a remake of the old Whitesnake song “Trouble”, a bit heavier and more raw than the somewhat polished original. It’s a fabulous version and it makes me think of how good Whitesnake would be if Coverdale reformed the old Marsden / Moody / Murray line-up again. I haven’t heard Cov sing with this much depth and intensity for ages. Marsden shows his love for the softer kind of rock with “Who Do We Think We Are”, a song that is AOR and even borders to West Coast rock – brilliant! “Bad Blood” is a killer blues groover that features some really fine, gritty lead vocals by one Cherry Lee Mewis – a gorgeous country singer from Wales. 7. Who Do We Think We Are?